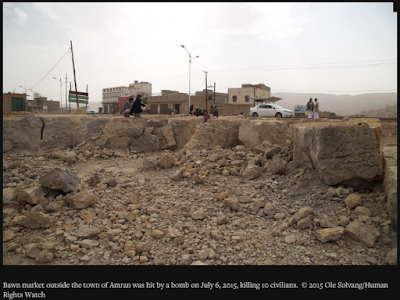 On 6th July 2015, the Saudi led coalition airstrikes hit 2 markets in the governorate of Amran in Yemen, killing a total of least 29 civilians including 1 woman and 15 children, and injuring at least 24 more. 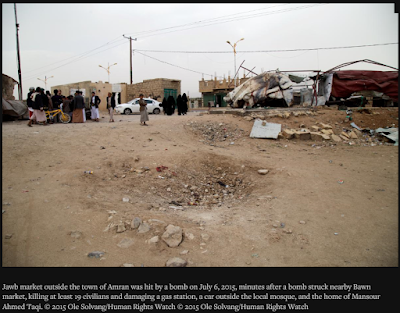 Starting about 4:30 p.m. on July 6, bombs hit two locations in the governorate of Amran, north of Sanaa, killing at least 29 civilians, including a woman and 15 children, and wounding at least 20 civilians. "I suddenly saw all this dust rise and felt something hit my back, and then I blacked out. I woke up at Raydah Hospital at about 6 p.m. The doctors had removed a metal fragment from my back. I later went back to the site of the strike and saw how close I had been, I was only 15 meters away from where the bomb landed." 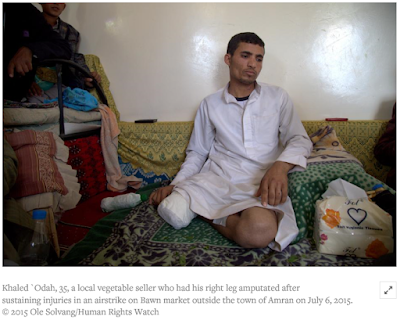 Radwan Yahya Ahmed, 25, a fruit seller injured in the strike, showed Human Rights Watch his wounds. Doctors had to remove large pieces of skin from his shoulders to transplant to his cheeks. He and other witnesses to the strike interviewed by Human Rights Watch said that they had not seen any Houthi or allied military vehicles on the road at the time of the strike, nor did they know of any military targets in the area. The Bawn market strike killed at least 10 civilians, including nine children, and wounded at least six. Minutes later, a second bomb struck the Jawb market along the road just over one kilometer (0.62 miles) further north, damaging a gas station, a car outside the local mosque, and the home of Mansour Ahmed Taqi, 40, a local farmer.The market had been there for at least two years and was the largest in the area, attracting hundreds of people daily. "He [Zahir] was calling and waving at me to grab my bag and to leave the house as quickly as possible, saying that the planes might bomb us as well. About 15 meters (16 yards) from our house, suddenly another bomb landed. A piece of metal hit him in the back and cut through his side, killing him. We found Taqi’s body ripped to pieces. My husband’s cousin was close by, but was only wounded. My husband was just a simple farmer, but later on TV, they said he was a Houthi trainer. I don’t know why they would lie about that, but I promise you it’s not true." Mabkhoot al-Jawbi, a local farmer, 70, said his son, grandson, aged 17, and two cousins were killed in the blast. He helped with the burial at the local mosque and said that he helped with 17 funerals of local villagers. Mansour Ahmad Taqi, another relative of Zahir Taqi, said he was home when the strike hit, damaging part of his house. When he came to the gate, he saw at least 20 wounded and dead lying in the market place, at least three in the car outside the local mosque, another person lying at the gate of the mosque, and another three people lying near the entrance to the home of Zahir Taqi—namely Zahir, his son Taqi Zahir Mabkhoot Taqi, aged 9, and his cousin Habib Saleh Taqi.“His son’s hand was found inside the electricity meter of the house on the other side of the road days later,” Mansour Taqi told Human Rights Watch. The Jawb market strike killed 22 people, at least 19 of them civilians, including one woman and six children, and wounded 14. Four of the dead were members of the Taqi family. Three people who were in a car at the time of the attack had not been identified at the time that Human Rights Watch visited, so it was not possible to determine whether they were civilians. Al-Jawbi told Human Rights Watch that after the attack, there was no more market in the area: “Now there is nothing. People are afraid.” He said that he was unaware of any military targets in the area, such as military vehicles, at the time of the strike. According to Khaled Sanad, the representative of an aid organization linked to the Houthis, a third airstrike hit a security checkpoint south of Amran, about 15 kilometers (9.3 miles) away, at about the same time as the attack on the two markets, killing four Houthi members manning the checkpoint and three civilians who were on the road at the time. WARNING: the media below is graphic and distressing. It is placed here as evidence as war crimes to call for an independent investigation and to call on the international community to respect the Arms Treaty by stopping the supply of weapons to Saudi Arabic as they are clearly targeting civilians.